The area is one of outstanding natural beauty and serenity with Inishclare being just one of the islands which can be found along the shores of picturesque Lough Erne. Old Inishclare meant “woody island” and probably received its name from the dense forest of trees which would have once covered the island. Today most of the forest has been cut down to be replaced by green pasture and the island has since been renamed “Horse Island”. An island close to the houses is an area of special scientific interest and is an RSPB reserve – ideal for bird watchers and children. The cottages also have the added attraction of peacocks, peahens and guinea fowl wandering freely through the grounds – the peacock tails are fabulous with splendid colours when in full display. These attractions combine to add colour and character to the setting making Inishclare Cottages the ideal holiday location. The larger Cottage sleeps up to 7 people comfortably, enjoying high standards of modernisation with two shower rooms. The stylish lounge area and fully equipped kitchen have amazing views and the kitchen in particular, enjoys wonderful morning light. The patio area is equipped with furniture and allows great views of the lake. The smaller Cottage sleeps up to 4 people and also enjoys the same high standards. 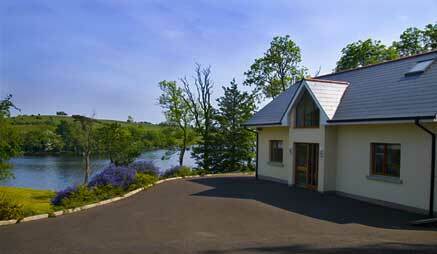 Inishclare Cottages are situated approximately 8 miles from Enniskillen on the B82 Enniskillen to Kesh Road.